Set in the beautiful countryside of the Haute-Normandie region of northern France, Dieppe is an historic town, strategically important since the 11th Century. There is a magnificent Chateau and an eclectic mix of architecture that add a sense of character and history to the town. All this was the back drop to the Dieppe Kite Festival 2014, one of the biggest kite events in the world. Each year the festival focuses on a selected country, featuring the kites, costumes and culture of that country. This year two countries were selected; India and Indonesia. All around the town and at the festival site you could see and hear the sounds of these countries. It is a magical and sometimes surreal experience! 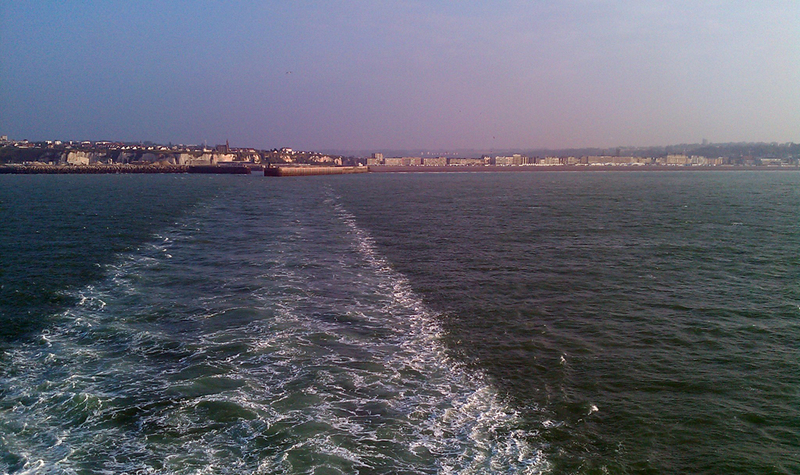 The festival itself is set on the 8 hectares of close-mown lawn that runs between the pebbled beach and the town. A row of white marquees line one side of the field, each tent hosts a different nation’s delegation. The tents are a place of meeting to look at and talk about that countries kites and culture. During the day the tents are manned by the delegation who entertain, inform and educate the thousands of spectators who come to the festival. Running down the centre of the field is the exhibition area and trade tents. 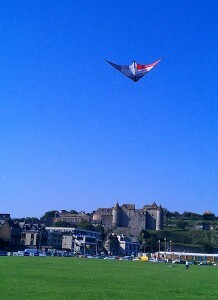 The sport kite fliers are to be found at the end of the field underneath the Chateau. We have a large field all to ourselves complete with an ENORMOUS PA system. During the weekends the crowds gather 10 deep around the edge of the field to watch the shows. The crowds applaud and cheer enthusiastically inspiring the fliers to try just that little bit harder than normal. It is a wonderful experience! This year we had displays by The Flying Squad (UK), Steff Ferme (F), Lisa Willoughby (USA), Now’Air (F), Loustiks (F), Fusion (UK), Panam’Air (F), Air Heads (UK), as well as the amazing skills of the multi-kite flying Jean Lemire (CAN) just to name a few. Add to this the fabulous commentary from Jean Lamoureux (CAN) and you end up with a show second to none. The festival is too big to cover in one small article. 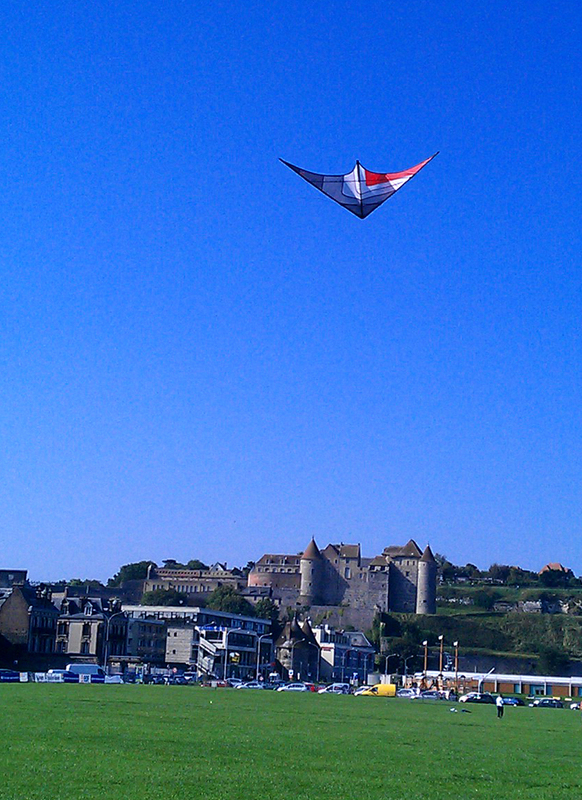 Let us just say that if you are tempted to visit a kite festival where you can see every type of kite, fliers from every (well almost) country and some of the best sport kite teams in the world then Dieppe has to be at the top of the list! We will be back again next time.